This chicken shawarma we made as kabobs for the Healthy Living Community barbecue this year but at home we have been using whole chicken pieces which take longer to cook but I find more delicious. The coconut yogurt is perfect if you aren't doing dairy and 2 teaspoons of astefoeda can be used instead of alliums if you aren't doing those. I like to let my marinade go 3 or 4 days with most meats and this recipe is not exception. You can even marinade and then freeze for another day, which you all know, I love to do. Then you can make 2 or 3 dinners worth in containers ready to take out of the freezer in the morning to cook in the afternoon. The recipe here is for the oven but you can easily grill this chicken in whole pieces or in kabob sized pieces on skewers. The grill needs to be watched but as we all know grilled food tastes best! When you can't take time on the grill 90 minutes in the oven makes for an easy dinner. 1- Combine yogurt, pepper, allspice, coriander, cumin, cinnamon, salt, garlic, and the onion in a bowl and stir together. 2-Mix in the chicken cover and refrigerate until ready to use. I let mine marinade for 3 or 4 days or freeze until you are ready to use. Give the chicken at least a few hours to marinade at the very least. 3. 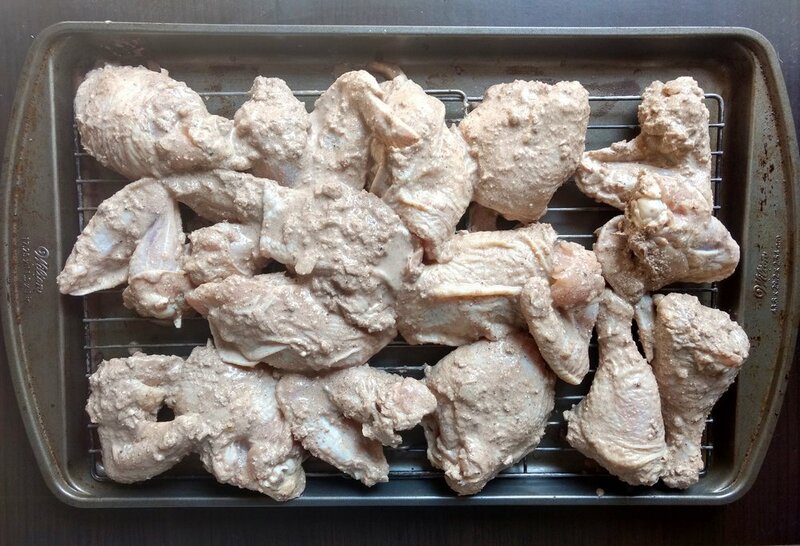 Pre-heat the oven to 350 degrees while you are putting the marinated chicken on a baking tray with racks for even cooking. Bake for 90 minutes or until brown, crisp and cooked through. 4. Season with sumac and eat with a cucumber salad and cauliflower rice.